If you’re looking to add a little luxe to your bedroom, then the perfect way to complement the look is to add some sparkly bedroom furniture. Whether it’s a touch of glamour or a full bedroom makeover, these ideas will help you inject a little glitter into your home… without going completely overboard. One of the best ways to showcase furniture with a little sparkle is in a silver or white themed bedroom. Think mixing textures together: satin, fur and jewels to create your very own luxury boudoir. You can also pick a secondary colour to complement the look, such as a purple or pastel colour, but the key is to keep it subtle. You don’t always have to go all out when it comes to sparkle. If the thought of a full-on jewel dresser fills you with terror, go for smaller touches on your bedroom furniture instead: a subtle diamante detail on your dresser chair, for instance. Similarly, if you’re envisioning glitter everywhere, you can get the look by choosing crushed velvet instead. This works particularly well for a bed, giving a sparkly look without any potential mess, but can also apply to chairs. Sparkle can, of course, also work in the kids’ bedroom, particularly where there’s a theme involved. 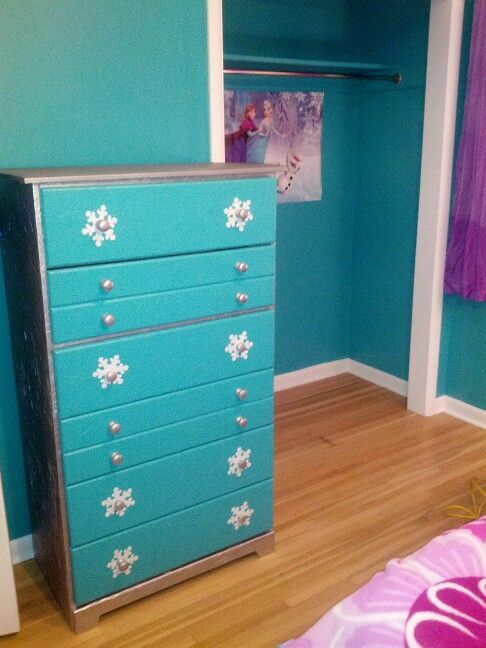 Why not enhance a Frozen themed bedroom with a matching sparkly blue wall and drawers? Whether you’re on a budget or are ready to splash the cash, there’s a number of outlets that specialise in glitter bedroom furniture. Believe it or not but there’s an entire company devoted to creating a range of glitter goods. From sparkly pillows to glittery dining chairs, this Devon-based business also focuses on silver crushed velvets to match. They’ve even provided furniture for celebrities, magazine shoots and television programmes. Price range: Be prepared to spend anywhere between £249.99 to £699.99 on an item of bedroom furniture. Similarly, you can also pick some sparkly gems with bespoke retailer Sparkle Homes. Specialising in glamorous and bespoke furniture, the company offers various collections from crystal to venetian. Price range: Be prepared to spend anywhere between £190 to £575 on an item of bedroom furniture. Luxury furniture retailer Hos Home specialises in everything from stunning sofas to designer beddings, but they also have a selection of sparkly bedroom furniture to inspire. Price range: Be prepared to spend anywhere between £289 to £599 on an item of bedroom furniture. Home store Dunelm Mill is a great place to keep an eye on if you’re dreaming of the perfect silver bedroom. Collections, such as the pictured Toulouse range, are often available and offer furniture at varying price points. Price range: Be prepared to spend anywhere between £79 to £449 on an item of bedroom furniture. Your local Argos might just be selling metallic bedroom sets for a fabulous price if you’re looking to kit out your entire bedroom, as opposed to just adding a statement piece or two. Price range: A bedroom furniture set of two or three items can cost between £87- £1000+ depending on what’s included. Both Amazon and Ebay are great places to browse silver bedroom furniture, but also be sure to check out your local Facebook marketplace – particularly if you’re looking to bring sparkle to your room via home accessories. The online resource is often selling mirrors, dressers and tables that could just be waiting around the corner. Of course, you can always create the look yourself using an unloved piece of furniture from your attic or from a local charity shop. Make like influencer LaurDIY and create your very own sparkly drawers using a sander, primer, white spray paint, spray adhesive, metallic silver and glitter. There’s nothing like knowing you’ve created your very own furniture masterpiece!